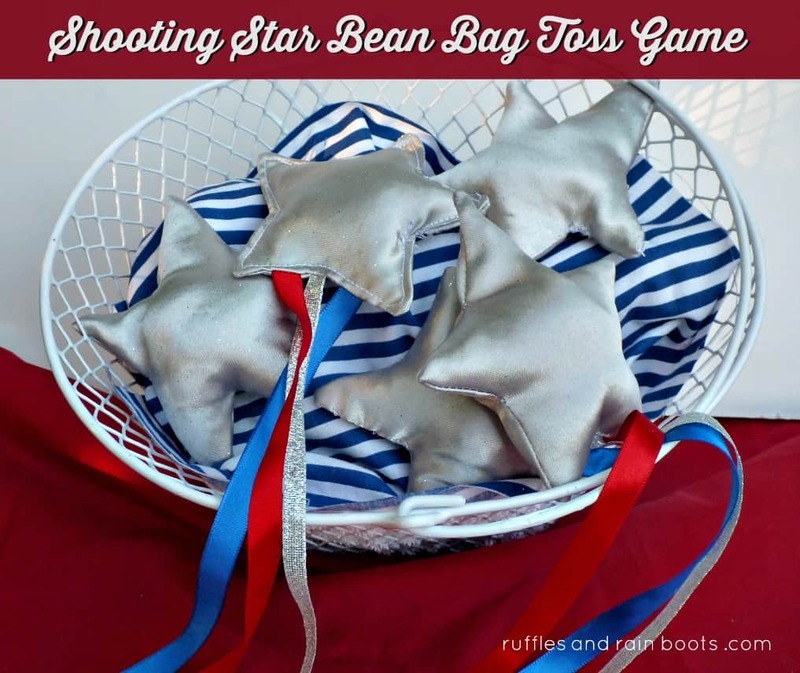 This shooting stars toss game is so much fun for summer. We’ve used this simple toss game to burn off energy, as a kid-safe game of horseshoes, and have even used them for target practice! 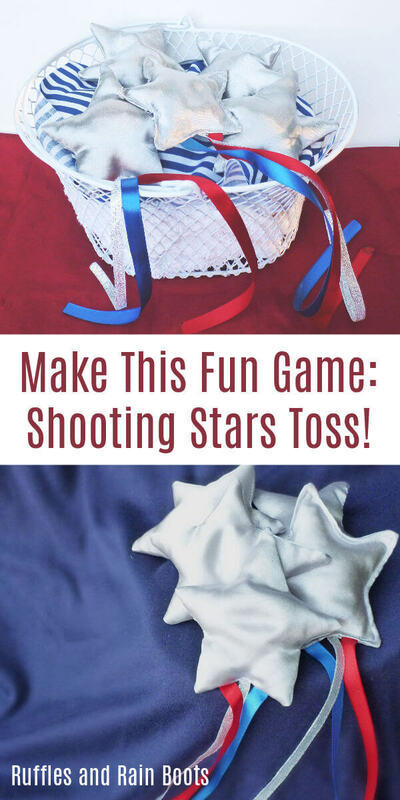 Let’s get started making a fun summer toss game for kids. While coming up with the game, I thought we could also use it for the patriotic holidays. I’m planning an Independence Day play date and thought this would make a great game for all of the little ones. We’ve only had these for a week, and Elise has played with them at least three times a day! I’d say that this one is enough of a success that I thought I’d share it with you all. Elise, at 2.5 years old, is getting more energy by the day, it seems. We go on walks, play at the park, and run around the house and she still has a ton of energy at the end of the day, even when she doesn’t nap! This toss game is great because she gets to work on hand-eye coordination, as well as run around a bit more while she retrieves the stars. I consider that a win-win. I had a quarter of a yard of a shiny, silver, glittery satin fabric. I only made 5 stars, but you can get quite a bit more from that amount of fabric. Just a few simple supplies to create a great toss game! I used my large star from the three star wand template, but you can use any shape of star. 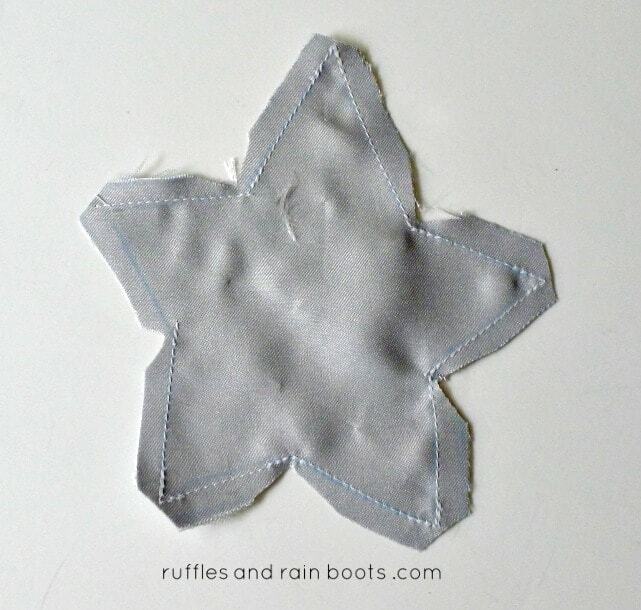 For reference, using this star (and adding the 1/4 inch seam allowance) yields a 4-inch bean bag. First, I ironed the satin fabric and pinned it right-sides together so that I would only have to cut half as many times. I outlined the star template and then added another quarter of an inch (or so), to account for a seam allowance. 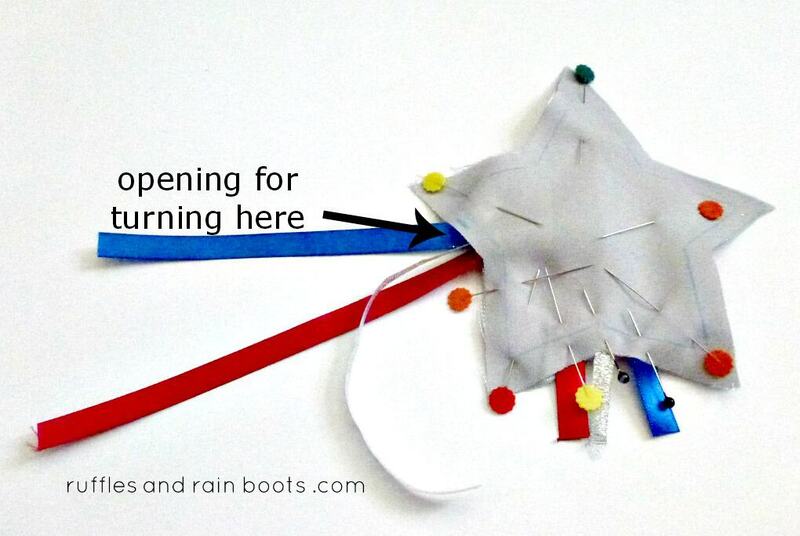 I pinned inside the star to minimize any fabric movement and then started cutting. I used a lot of pins to make these star bean bags. After cutting, I added some ribbon scraps, pinning them carefully. I use a TON of pins because I hate re-cutting fabric. Maybe I can earn the title, “The Laziest Crafter” one day? 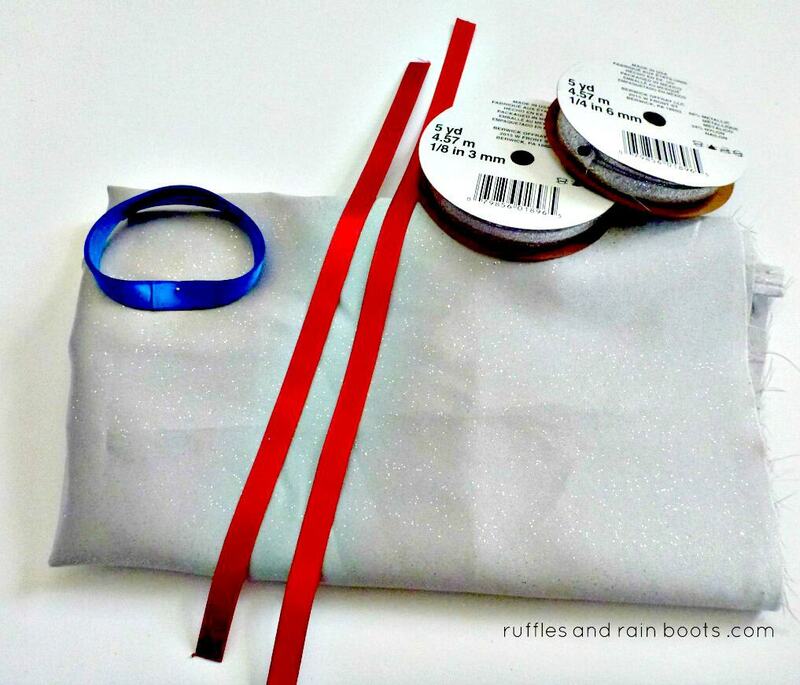 Add ribbons to create a shooting star. 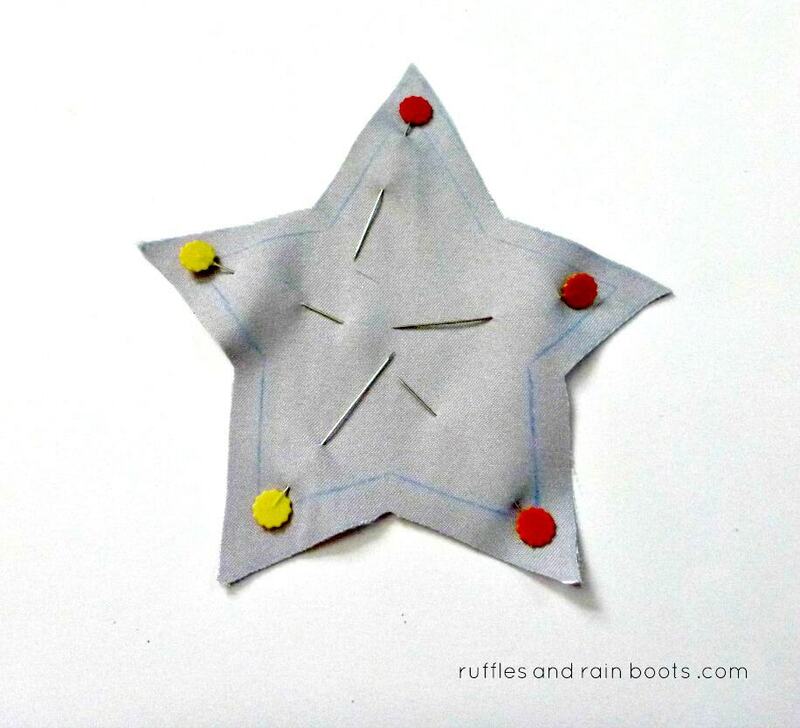 You can choose to make all of the bean bags ‘shooting stars,’ but because I was using scraps, I ran out of the red and blue ribbons after two stars. I thought about using just the silver ribbon – or making a trip to the craft store – but I just wanted these done. Obviously, the stars come together faster when you don’t have to pin the ribbons. I popped all of the stars over to the sewing machine and stitched them up, taking care to reinforce the points and angles of the star. I left about an inch on one side to flip the fabric and fill it (my turn opening). After sewing all but the turn opening, I cut the fabric on all points to help it lie correctly once turned. Don’t forget to snip the angles and points before you turn. Fill up the stars with rice, lentils, or any other small fill. I tried using beans but they wouldn’t get all the way into the points of the star, so that’s why I’d recommend something small as the filler like rice. Hand sew the opening closed using a ladder stitch and you’re ready to take them to the backyard for a fun game of toss. Elise and I have used all manner of receptacles: baskets, buckets, storage bins, and even each other’s hands. I just realized we need to make new boards for backyard corn hole and these would make amazing corn hole bags! The streamers on the back of the bags make it very festive. You’re done with this simple tutorial! Have a backyard get-together and let the kids (and the adults) have a bit of fun tossing these little cuties around! Thanks for sharing some time with us today. 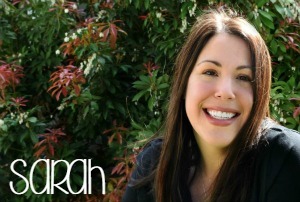 We would love it if you shared this with your friends and followers on Facebook or Pinterest.